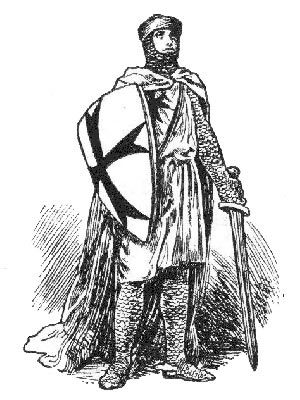 The Knights Code of Chivalry was part of the culture of the Middle Ages and was understood by all. A Code of Chivalry was documented in 'The Song of Roland' in the Middle Ages Knights period of William the Conqueror who ruled England from 1066. The 'Song of Roland' describes the 8th century Knights of the Dark Ages and the battles fought by the Emperor Charlemagne. The code has since been described as Charlemagne's Code of Chivalry. The Song of Roland was the most famous 'chanson de geste' and was composed between 1098-1100, describing the betrayal of Count Roland at the hand of Ganelon, and his resulting death in the Pyranee Mountains at the hands of the Saracens. Roland was a loyal defender of his liege Lord Charlemagne and his code of conduct a description of the meaning of chivalry. The ideals described in the Code of Chivalry were emphasised by the oaths and vows that were sworn in the Knighthood ceremonies of the Middle Ages and Medieval era. These sacred oaths of combat were combined with the ideals of chivalry and with strict rules of etiquette and conduct. The ideals of a Knights Code of Chivalry was publicised in the poems, ballads, writings and literary works of Knights authors. The wandering minstrels of the Middle Ages sang these ballads and were expected to memorize the words of long poems describing the valour and the code of chivalry followed by the Medieval knights. The Dark Age myths of Arthurian Legends featuring King Arthur, Camelot and the Knights of the Round Table further strengthen the idea of a Knights Code of Chivalry. The Arthurian legend revolves around the Code of Chivalry which was adhered to by the Knights of the Round Table - Honour, Honesty, Valour and Loyalty. The Knights Code of Chivalry as described by the Duke of Burgandy. Each section of this Middle Ages website addresses all topics and provides interesting facts and information about these great people and events in bygone Medieval times including Knights Code of Chivalry . The Sitemap provides full details of all of the information and facts provided about the fascinating subject of the Middle Ages!